EDIT: This post was moved from my old blog. 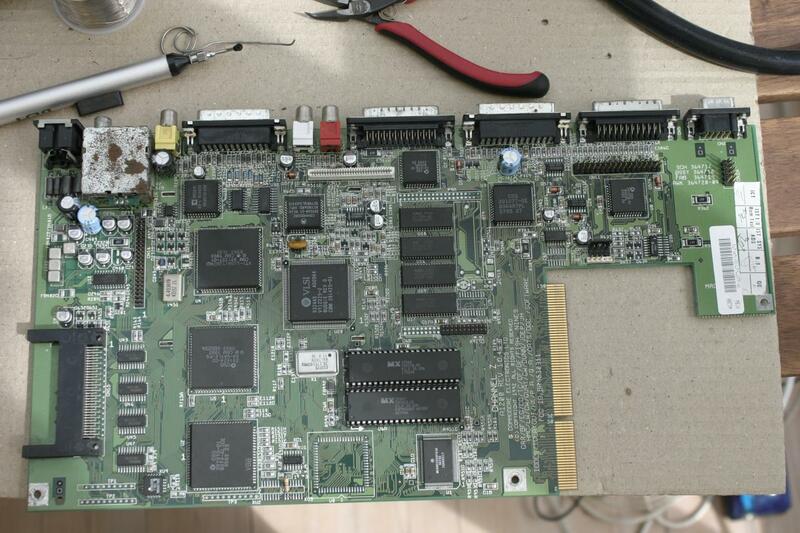 Yesterday I started on repairing the motherboard of an old Amiga 1200. For the first test it seemed to work fine. Then I started looking closer at the board. Looking closer on the blue resistors, those small blue ones in the middle of the picture, the solderings are matte, they should be shiny. 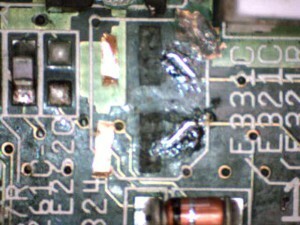 This is typical for old computers where the smd capacitors have leaked acid. Hold on. 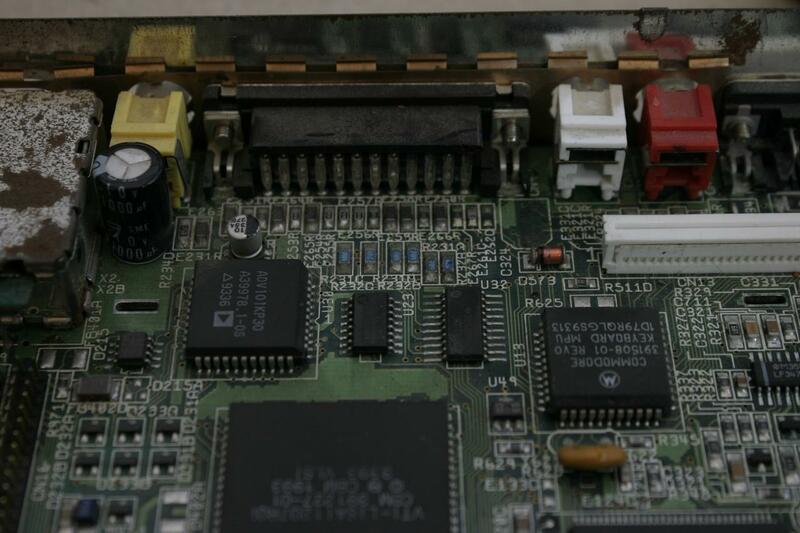 There seems to be a capacitor missing, just to the left of the white connectors. The solder pads are gone too. 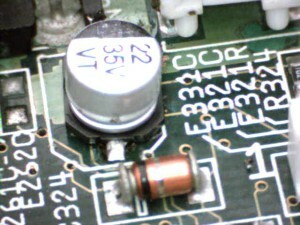 This capacitor is used for one of the audio out, if this is missing, no sound will be heard from on of the stereo channels. I checked the other channel, which was missing too, but solderpads were intact. 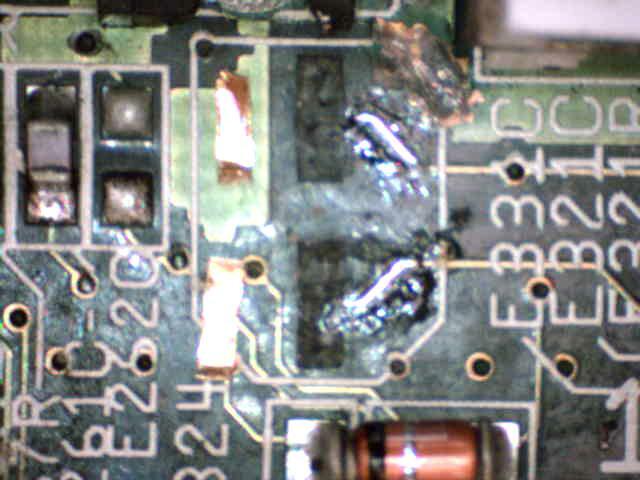 Working with lemon juice on a cotton stick to neutralize the acid from the capacitor, I gave it a good cleaning around the area. After that, a trip to the dishwasher. And letting it dry for ½ day. I probably won’t power it on for another week or so, so all the water should be evaporated for that time. 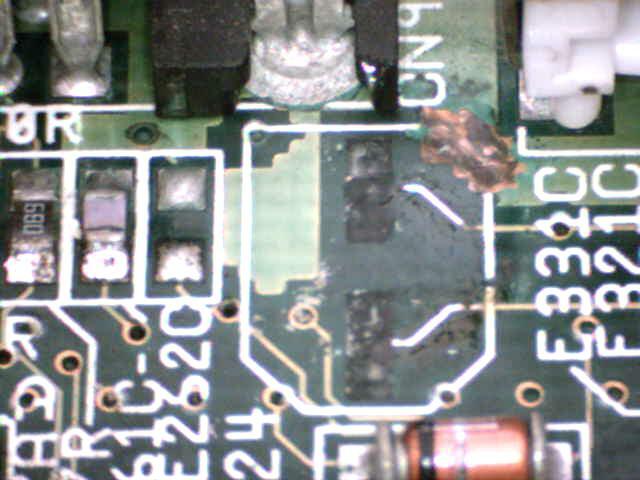 The following pictures were taken from a USB microscope bought for $1 on ebay, quality is not perfect, sorry about that. 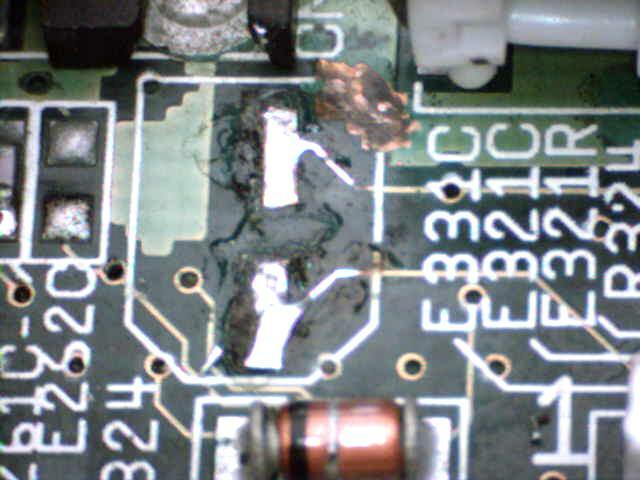 I scraped off the protective layer of the rest of the wires, and tinned them afterwards. 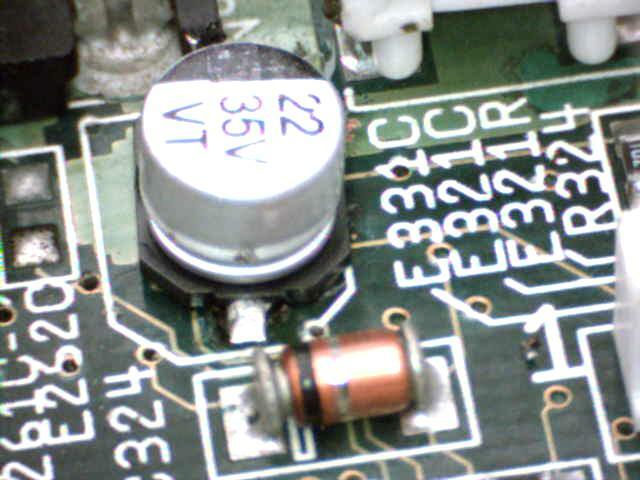 Time to look for something that can be used as solder pads, as I didn’t dare solder the new capacitor onto the wires directly, they are just too fragile. 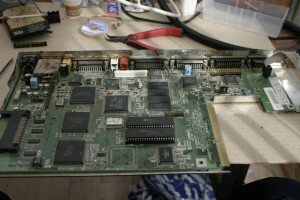 I found an old PCI board this is a promise SATA150 controller. Using a simple knife, this one isn’t particularly sharp, I managed to remove a couple of connector legs. 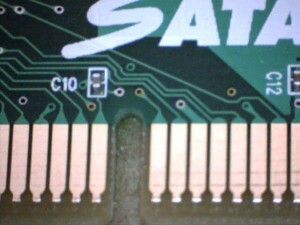 I used some loc-tite glue to glue the pads to the pcb. I found out later I should probably have used another kind of glue as this one got liquid again when warmed. 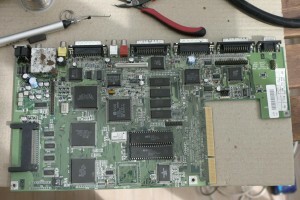 After a little work I managed to tin the connectors, and get a connection to the wires. It’s not the best solution, but it’s better than the alternative. 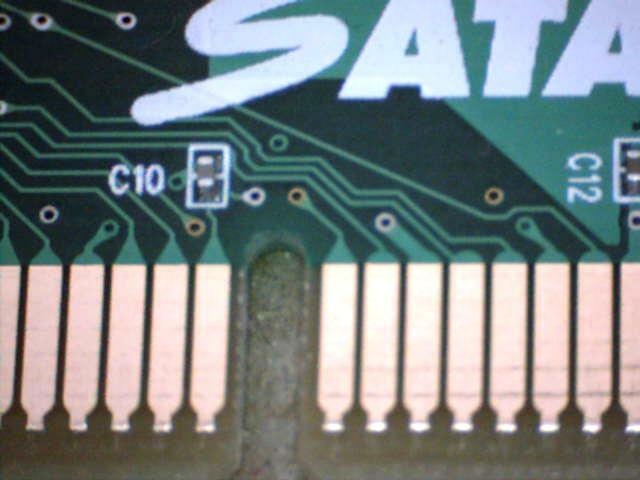 I also tinned the copper surface to prevent it from oxidizing. Almost finished board, this now has it’s SMD capacitors replaced, a trip to the dishwasher and cleaned some acid infected solderings. 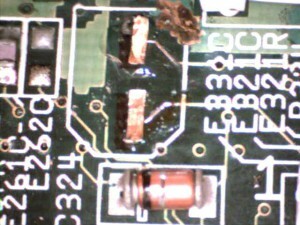 Only the 4 non SMD electrolytes are missing from replacement. Only the electrolytes were replaced. Spin the house around till it falls off. 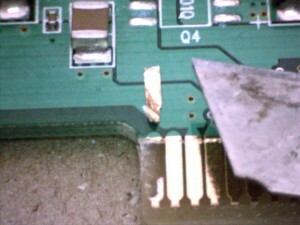 Use the solder iron to remove the broken pin from the solderpads. 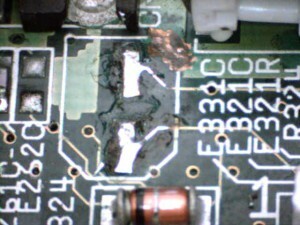 Clean the solderpads with a desoldering wire. Attach the cap (remember in the right direction), eventually adjust it so it looks nice too. Heat the solder paste with your solder iron until it gatheres around the pad and cap leg. 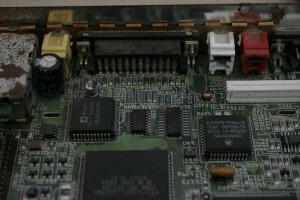 Instead of solder paste you can also use a thin solderwire. I use that when it’s easy to access the pads. I use a 0.25mm wire for that. 0.6mm should be good too. New status – I’ve tested the amiga board, and everything runs perfectly (floppy, sound, video, harddrive), except for the right mouse button. Activating the right mouse button gives a click in the sound, and it’s not functioning, I’m affraid that I’ll have to replace paula. did you ever resolve the RMB issue? I’m having the same symptoms on an A1200 I just recapped.